Naturally low in fat, high in fibre and rich in protein. 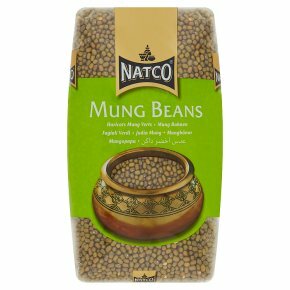 Suitable for vegetarians.Mung beans Highly nutritious with a creamy texture and nutty flavour. Mung Shaak Serves 4 Ingredients 250g Natco mung beans, soaked overnight and drained; 950ml water; 1/2 tsp mustard seeds; 1 onion, chopped; 2 garlic cloves, crushed; 2cm fresh ginger, grated; 1 tsp Natco chilli powder; 1/2 tsp Natco turmeric; 1 tsp Natco ground coriander; 1 tsp Natco ground cumin; 1 1/2 tsp salt; 2 tomatoes chopped; 2 tbsp coriander, chopped. Method Heat oil in a large saucepan then add the mustard seeds. Once they begin to pop, add onions and fry until soft. Add garlic, ginger, turmeric, chilli, ground coriander and cumin then mix well for 1 minute. Add the beans, tomatoes, salt and water and bring to the boil. Cover and simmer on a medium heat for 30 mins till beans are soft. Garnish with chopped coriander leaves. Soak beans in water for 12 hrs or overnight. Rinse thoroughly and drain. Add fresh water, bring to the boil and simmer for 30-40 mins or until tender.Caution: Do not eat raw. Never cook beans in a slow cooker unless pre-soaked for 12hrs and boiled for 15 mins.